As announced here on February 21, the sixth annual Summer Theology Program of the Albertus Magnus Center for Scholastic Studies, held in Norcia, Italy, is accepting applications from prospective students. With the program running from July 2-14, now is the time to apply! In addition to our usual heady round of prayer, study, conversation, quiet walks, and ample Italian meals, this year's program is going to be special in two ways. 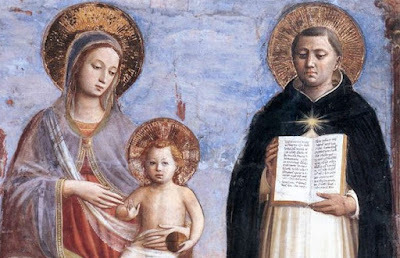 First, we will be studying the sacraments in general, and baptism and the Holy Eucharist in particular, using the first-ever English translation (with facing-column Latin original) of St. Thomas Aquinas's first mature theological work, the Commentary on the Sentences of Peter Lombard. As a major participant in the project to get this work translated and published, I can assure you that it is an intensely interesting and provocative text to work with -- not as lapidary as later Aquinas, and rather adventuresome in its objections and arguments. It should be a great text for seminar discussions. This commentary was, for many centuries, one of the most influential texts in Catholic theology due to the way it readily lined up with Sentences commentaries by a host of great scholastics (e.g., Albert, Bonaventure, Scotus). Second, we will be spending our study, prayer, and discussion time up in the quiet and beautiful hills above the ancient town of Norcia. The view from there is stirring. We will be living near the new location of the Benedictine Monks of Norcia and assisting at their chanted office and Mass. It is an exciting time to be part of the spiritual and material rebuilding of Christendom at its symbolic heart, the birthplace of the Patron of Western Monasticism and Co-Patron of Europe. The Albertus Magnus Center has always been and will always be devoted supporters of the Monks of Norcia, with whom we wish to show our solidarity. Allow me to emphasize that this is not a program for academic specialists but for anyone who is seeking a deeper grasp of Catholic theology at the feet of the Angelic Doctor and who is willing to do the reading and be involved in the discussions. Past participants have included grad students, married couples, retirees, priests, religious, and seminarians. If you are considering taking part in the program and have any practical questions about it, please feel free to write to the director, Mr. Christopher Owens. Although we have not raised our tuition compared with former years, our overall per-person expenses this summer are higher, due to logistical difficulties following from last year's earthquakes. We believe that this Summer Program, so beneficial to students from around the world and to the Monks of Norcia themselves, is a worthy endeavor that deserves to keep going long into the future. In particular, we are eager to find sponsors for seminarians and graduate students who demonstrate their worthiness and financial need. Any readers who would like to make a tax-deductible donation to ensure that the program continues should contact the director Mr. Christopher Owens, or, if they prefer, use the online donation page. Thank you for your prayers and your support!